For years, green has been the most reliable hue for live brain imaging, but after using a new high-throughput screening method, researchers at The John B. Pierce Laboratory and the Yale School of Medicine, together with collaborators at Stanford University, have identified a new fluorescent protein that will make it possible for live neurons to glow red when activated. This study was released online today in Nature Methods. Click here to read full paper. 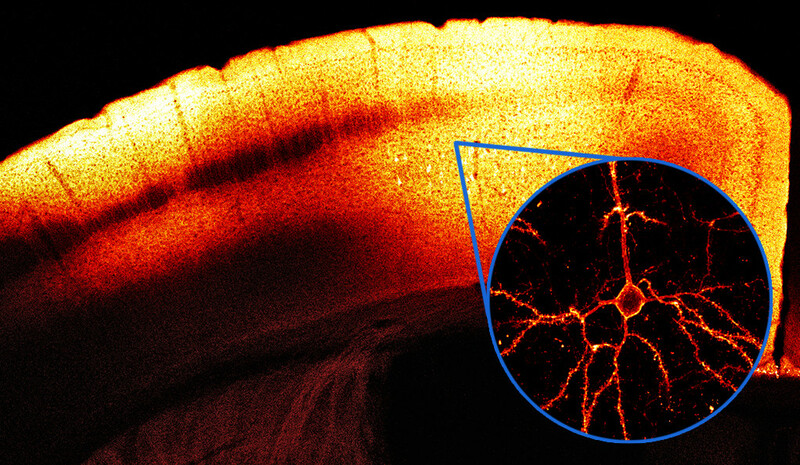 This Voltage-Activated Red Neuronal Activity Monitor — or VARNAM for short, which means “hue” in Sanskrit — is part of a family of proteins called genetically-encoded voltage indicators (GEVIs), which change their fluorescence intensity when an electrical impulse shoots through a live neuron. Ganesh Vasan, co-first author and associate research scientist, explained that the automated screening approach he established allowed them to identify VARNAM. The high-throughput approach made it possible to screen thousands of potential red fluorescent proteins and select the most voltage-sensitive among them — the brightest and fastest to appear when a neuron is activated — in an efficient manner. Previously, red fluorescent indicators had been too slow or too dull to be useful for researchers who are observing the functioning brain. Additionally, when experimenters wanted to watch two different groups or types of cells in action, they could not tag them with more than one color GEVI at the same time. The team not only demonstrated that VARNAM works in multiple systems, both in vitro and in vivo, but also used VARNAM to capture brain activity spikes in live flies in two hues — green and red — for the first time ever. Now, with red in the mix, scientists will be able to monitor the full “read-write” process of live neurons accurately and easily, said the researchers. 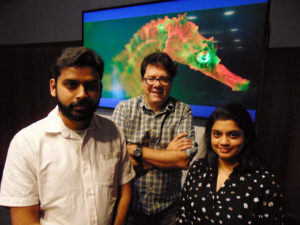 Authors (left to right): Ganesh Vasan, Vincent Pieribone, Madhuvanthi Kannan of The John B. Pierce Laboratory and Yale University present their findings in Nature Methods, now available online. This study was funded by grants from the National Institutes of Health. Other authors on this study include Cheng Huang, Simon Haziza, Jin Zhong Li, Hakan Inan, and Mark Schnitzer from Stanford University. This study appears online in Nature Methods.